The visit to Morocco has really been a special experience and I both love the country as I find some things a bit strange. We have been to Mohammedia, Casablanca, Marakesh, Safi and currently we are in Agadir. 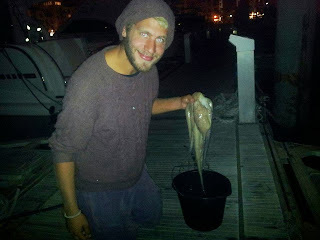 Yesterday a local fisher man in the harbor gave us an octopus that was totally alive, it even tried to flee over board with its strong tentacles. Luckily he had killed the nerve system in the head and he died quite quick. I boiled the slimy animal for a couple of hours, then fried it together with onion, parsley and cos cos. Very tasty I have to tell you. Now we are about the head for Lanzarote, see you in Spain.